Distracted driving is the number one cause of car accidents in New York City and in the US. While teenagers and young drivers are often perceived as the most susceptible to use their cell phone while driving, a new study indicates that seniors are indeed as bad or even worst than the kids. While previous statistics indicate that around 50% of young drivers recognize that they are talking on the phone while driving, a new study found out that nearly 60% of seniors say they are doing exactly the same. Conducted by a group of researchers from the Training, Research and Education for Driving Safety (TREDS) program at University of California San Diego School of Medicine, the study looked at the driving habits of 397 Southern Californians age 65 and older. 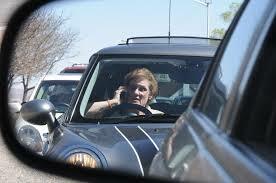 Among the 82% of them who said they owned a cell phone, 60% said they spoke on the phone while behind the wheel. These statistics are extremely alarming as when people get older their driving can be reduced by additional factor such as a medical condition or medication use. Alertness and mental processing also often decrease as people are getting older. Among the seniors studied, approximately a quarter of them drove with children younger than 11. 42% of them told surveyors that they had been talking on the phone while children were in their car. This attitude not only put children at increased risk of accidents but also taught them bad habits. The study also found that among seniors, men as well as people who are driving a lot or those who are self employed are the ones who are the most susceptible to using their cell phone while they are driving. in 2009, there were 33 million drivers over 65 year old, according to projections, in 2030 there will be 70 million drivers aged between 65 and 85 years old.